OOC - LD, it is an excellent idea. And there is an EASY way to increase the knowledge/numbers of practitioners/goods in the fields you mentioned. I won't sell that out though, but it should be somewhat obvious. Polycarp, I've updated my play-post, just letting you know. Happy March 1st! Today is the last day to post orders. At this point, if you decide to edit your orders, please post here or PM me so I know. The update will absolutely 100% definitely not be posted today, owing to my absorption in other CBG activities recently. I will try to get it out to you as soon as possible. PS. Just a friendly reminder to Llum that I need his War PM sometime today, if possible. Updated my post with a couple more orders. Updated orders on page 15... (corrected 1 WEALTH invest; not 3 wealth), and added some discussion about a granary. -Go to war on the Sabbine Fortresses of Farfa. Pay the cost from my own wealth. -Make sure to bring lots of siege equipment and pitch. -Bring House Guard as personal retinue, bodyguard and overall help. Make sure they gain lots of experience on siege equipment. -Send Representative to Konstanz as requested by Frederick. He should say that Rome is as ever a loyal vassal to the Holy Roman Empire and to clear up the confusion that we did not mean to imply that we would crown him, but that he is welcome to come and be crowned by the Pope. The Pope himself is welcome in Rome, he may even stay on my personal residence if he fears for his safety, even if the Roman people are displeased with him. Troops: 80% of all armed forces (80% militia, cavalry and labour). Special emphasis on bringing a lot of pitch and siege equipment. Commander: Fortis Calafatus as commander recruiting anyone who's shown skill as aides and sub-commanders. No Pierlionists in high command. Heh. Well I have hired 100 skilled mercenary infantry who shall be sent to aid this cattle quest under the command of the Consul. Perhaps if the consul is so inclined he will be willing to share in this most generous windfall of moo'ing loot. I see that the good Consul has decided to act in earnest and it brings me no small joy to know that the senate is willing to protect its allies so quickly. I promised aid but busy is the life of a merchant and a senator and there is much to see to and I was not perhaps expecting so quick a response from the Consul. Nevertheless, I offered aid and I stand before you as an honorable citizen and a christian and will not renege on my promise. I have thus seen to it that men of my own shall be sent along to aid in dealing with Farfa. I hope that this act will show my earnest desire to work with a friend of Rome such as yourself in overcoming all obstacles. With god's aid we shall have victory in this and Rieti shall have chance for peace. Summer in Rome is a time of unbearable heat, when the wealthy flee to country estates and the rest of Rome suffers in the stifling and malarial air. The peasants must work regardless, mowing hay and weeding their gardens until it is time to harvest winter wheat and rye. By the end of summer, the grain must be reaped, threshed, winnowed, and milled into flour. The feasts of the Assumption of Mary and of St. Peter and St. Paul are celebrated in the summer, the latter especially important in Rome, the seat of Peter’s blessed heir. Landlords take their cut at harvest time. All noble Senators will gain 1 Wealth this season. Foreign news this season has been dominated by momentous events in Africa. A decisive battle has taken place in the lands of the Saracens of Africa. For a century Africa has been held by the Banu Hilal, a confederation of Arab Bedouin tribesmen with a loose loyalty to the Fatimids of Egypt. It is said that on the plains of Setif, the Banu Hilal were utterly crushed by the Almohads, a Berber religious movement from the west. The defeat was so complete that the Banu Hilal have ceased as an independent people, with most of the remaining Bedouins deported westward with their families. There seems to be no resistance to Almohad rule in Africa save in Tunis and the Sicilian coastal strongholds. Philip of Mahdia, Admiral of Sicily, has taken advantage of the chaotic situation to undertake a naval campaign against the African coast, and has succeeded in capturing the Kerkennah islands for the Sicilian crown. Rome has invaded the territory of Farfa Abbey, and the “Consular Army” of Rome has penetrated all the way into Sabina, plundering villages, razing vineyards, and taking at least one castle from the local lords. As June arrives, the Romans are besieging the castle of Capofarfa, a Farfan strong point overlooking the Via Salaria. Opinion was divided on the arrangement struck between the Senate and the Pierleoni. For the first time in a year, the city is now united; Pierlonist militiamen retreated from the Theater of Marcellus and surrendered the bridges of Trastevere, then returned to the Leonine City, where a good portion of them were disbanded. There remains an invisible line down the Tiber, however – the Senate has confirmed Patrician Giordano Pierleone in his titles and allowed him lordship over the Leonine City and Magistracy over Trastevere, where support for him remains strong. This apparent cession to the Pierleoni enraged some who had called for his head after the events of October, but the popolo grasso and equites are on the whole quite pleased with the resumption of normalcy. While a fair number of the lower classes call Consul Basile a traitor, the merchants and wealthy tradesmen approve of his peaceful handling of the situation in time for Holy Week, and the Senate received him with a standing ovation. Consul Basile has lost 1 Popularity and gained 1 Influence. The Senate took steps this season to address the corrupt and chaotic court system much maligned by the Romans. Temporary buildings were set up in the Forum for judicial use and holding court in private was outlawed, but the law remains rather ineffective with far too few legal experts and notaries for far too many illiterate judges. Some have simply made up punishments, leading people to charge some Senators with deciding cases unfairly or on the basis of personal favor or patronage. Holy Week was, much to everyone’s relief, a success. The Faliscans made no effort to hold up the yearly pilgrimage as some had feared, and the pilgrims from far and wide brought with them many purses that left in a far lighter state than they had arrived. Holy Week is, perhaps, the only time of year when the usual Roman temperament, a heady blend of indignation, pride, contempt, and bloodlust, is suppressed to put on a good face for the foreigners. Some pilgrims were upset that the Holy Father and other great men of the church they had come to see were absent, but most were interested in spending Easter in Rome rather than personally glimpsing the Pope, who is said to be in poor health anyway. Senators got in on the action in a variety of ways – hosting pilgrims at their estates, buying up lodgings for paying customers, and in the case of Senator Manzinni selling handwritten “guides” – loose pages with maps on them, for the illiterate – for modest sums. How profitable the venture was is unclear, but it did start some entertaining dung-throwing skirmishes between Manzinni’s pamphlet-hawkers and Roman city guides who accused the Senator and his “papers” of cutting in on their action. Pietro Colonna returned to the city during Holy Week in a grand fashion, paying his respects at the major basilicas and resuming his residence at the luxurious Palazzo Colonna. It is rumored that he visited the Leonine City on the day after Easter to dine with Patrician Pierleone, who they say is alive and well but walks with a limp. Easter fell on April 19th in 1153. It was the end of the month by the time the Romans were prepared to move out; the Reatini, perhaps, would have preferred an earlier attack, but the Senate judged it simply impossible to levy a proper army during Holy Week, and the militia protested the idea fiercely. The army that Consul Calafatus assembled for the second of his career campaigns was somewhat smaller than the one he had led against Tivoli, but considerably more professional. Though turnout among the militia and rural folk had been mediocre, the Reatini delegates had managed to excite the equites about the project, and the Consul had practically the full complement of Rome’s citizen-cavalry available to him. He was further supported by his own private guard, many of whom were now mail-armed (though not very experienced), and around a hundred mercenary footmen raised by Senator Sismondii over the course of April, consisting of a mix of local freebooters and Frankish men-at-arms who had signed up while in the city for the pilgrimage. As the crow flies, Rocca Sinibalda is 35 miles from Rome. The most obvious route north was the Via Salaria, the old Roman road from Rome to the Adriatic via Rieti. The army set out along this road, their left flank secured by the Tiber River. The first non-Roman settlement to be encountered was Monte Ritondo, a castle-town 15 miles or so north of Rome, considered to be one of the key defensive points on the Roman periphery. The local lord, Signore Niccolo Capocci, was in residence. He rode out to parlay with the Consul, offering food and a promise of friendship to Rome if the Romans would refrain from pillaging his lands. 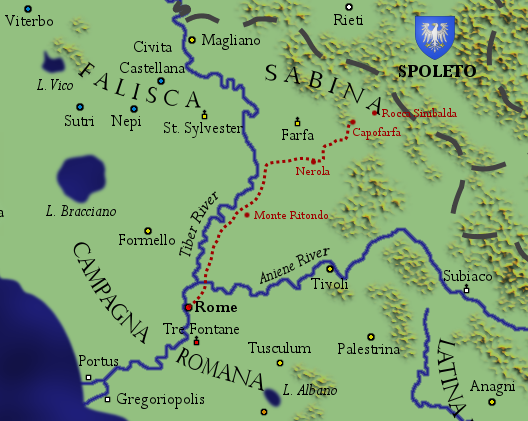 The Consul agreed, and after gaining additional supplies, they passed on from Monte Ritondo and turned east from the Tiber river by the 8th day of the expedition. They were now in Farfan territory, and the Roman command felt no further need to keep their foragers in check. In the usual fashion, the rustici fanned out from the army, raiding villages and farms to sustain the Roman force. On the 11th day, the Romans arrived on the outskirts of the territory of Nerola. Nerola was a key point on the Via Salaria, controlling a narrow section between the hills of Fara to the north and a group of mountains to the south. The town and its environs were overlooked by the Castrum Nerulae, a 10th century castle belonging to the Crescenzi, a very old Roman family that had once rivaled the Tusculani themselves but slid into virtual oblivion in the early 11th century. The Consul and his vanguard approached the castle and delivered their demands to castellan, as the lord was not present; the signore, in fact, was His Eminence Ottaviano dei Crescenzi Ottaviani di Monticelli, Cardinal-Bishop of Santa Celicia in Trastevere. The castellan initially refused, but when the Romans made good on the Consul’s promise to besiege the city, he had second thoughts. He proposed that he could not surrender the city now, but would send a message to his lord and request instructions; if no reinforcements were forthcoming within a fortnight, he would surrender the castle. The Consul gave him a week. The Romans had set their camp and begun assembling their siege engines by the time the seventh day arrived. Apparently, despairing of any hope of relief and with insufficient numbers to fight off the Romans, the castellan saw no point in continuing to resist. On May 20th, the 18th day of the campaign, he surrendered himself, his fortress, and his armsmen to the Roman Consul. A number of rural levies and militiamen were installed in the castle under the command of one of the Consul’s eques, and after a leisurely plundering of the town, the army marched eastward on May 22nd. Now in the heart of Farfan territory, the army turned back to ravaging the countryside. On May 24th, the equites treated themselves to a pleasant diversion by riding ahead of the army, taking the town of Poggio Nativo by surprise, and burning it to the ground. The army was in high spirits, and somewhat more orderly than during the previous year’s campaign against Tivoli, if only because it was not burdened by as great a throng of rabble. Still, it was difficult to keep much control over the rural levies, who roamed up to a mile from the army on whatever foraging errand they pleased. Drunkenness started to become a problem, as the Romans raided villages storehouses and wineries and returned to camp with jugs of monastic wine. By the 26th, the army was now properly in the hills of Sabina. The Via Salaria passed into a steep-sided valley, with wooded slopes rising 500 feet on either side. Less than a mile from the castle of Capofarfa, the Romans were ambushed by Sabine irregulars. The attackers were driven off, but the terrain prevented the Consul from retaliating with his archers or cavalry and the ambushers caused more casualties than they took. The castle of Capofarfa, on the valley’s eastern crest, was not so ready to surrender. Construction on Capofarfa only finished in the last decade; it was a modestly sized but very new castle built to guard the Via Salaria. Investing the castle was difficult; located as it was atop its valley crest, there were no good positions to set up siege lines or bring catapults to bear on the walls. As the end of Spring came, the Consul could report a so-far victorious campaign, but one that had not yet reached the ultimate objective of Rocca Sinibalda, and which seemed stymied by the stubborn garrison of Capofarfa and their inconveniently located fortification. As June arrived, however, another piece of good fortune fell the Consul’s way – he had, at last, reached his allies. On June 1st, a band of four hundred Reatini zafones arrived from the east, dispatched to find out where the Romans had gone to. Though the Via Salaria was still not clear, the Consul now had open lines of communication with his allies, and reinforcements that, while currently somewhat few, knew the terrain and the disposition of the enemy far better than his Romans did. One new unit, Zafones, has been added to the Unit Library. The interior Consul has provided the Senate with a report on the status of the treasury. Senators that requested information or launched endeavors have the results of their efforts listed here. This information is private, but you may certainly choose to share it with the Senate. You have accomplished some work on the walls this season, though work was slow due to the shortage of manpower – on Holy Week, the Romans are a very busy people, and afterwards many Romans had left the city on Consul Calafatus’ campaign. The funding you have expended has not yet run out, and work will continue through the summer. While this effort will help shore up particularly vulnerable spots, the Aurelian Walls are very long and very old and may prove quite expensive to fully repair and maintain. Though the Lateran was fixed up last season to function as a courthouse – a purpose it prove unable to fill – it still pales in comparison to the grandeur it had before its treasures were stripped away by the Romans and the retreating Papal forces. While some pilgrims did decide to stay in the Pope’s palace over Holy Week, the truly wealthy ones preferred lodgings in the palazzi of Roman nobles and merchants whose guest houses had not been so recently sacked. The Lateran did not produce enough profit as a hostel to make a difference measurable in Wealth. It was not difficult to acquire a copy of the Corpus Juris Civilis for the Roman Senate, but just as critical as the text itself are the glosses, the comments written in the margins by contemporary legal scholars explaining the meanings and applications of the otherwise impossibly arcane legal text. The “glossators” of Bologna are still hard at work in the production of these glosses, and there are many different commentary texts and differing schools of thought as to how Justinian’s code should be interpreted and applied. While the acquisition of the Corpus is a start, it will be difficult for the largely illiterate Senator-judges to understand and enforce without a class of knowledgeable legal scholars to rely on. At present, Bologna is the only city in Italy – indeed, perhaps in all of western Christendom – with an actual university of scholars, translators, and glossators working on these ancient texts. You have spent 1 Wealth this turn. You have spent 1 Wealth from the Defense Fund. You have lost 1 Popularity and gained 1 Influence. Very few of the renters you have acquired could be considered “wealthy.” The majority are tradesmen of the pololo minuto, who have higher status than peasants or laborers but lack the means or the rights of full citizens. They were, of course, very willing to meet with you – as if they had a choice – and it did give you some opportunity to hear their particular interests and needs. Most of it was boring working-class stuff, but you did find a surprising amount of vocal regret at the continuing rift between the city and the Pope. The Pope and the higher clergy was a great source of work for many craftsmen, constantly commissioning new churches, artworks, and country palaces, and without them a great deal of profitable work has fallen off. The Gregoriopolitans had no reliable information as to which places were least affected by the Roman Fever, which is after all carried by invisible marsh vapors. You had no difficulty occupying an unoccupied area of the salt marshes – after all, it’s all unoccupied – much more difficulty in finding men to work them. After Easter, many of the able-bodied peasants of the Roman contado were rounded up to serve in the Consular army campaigning in Sabina, and many of the disenfranchised peasants you hoped to recruit ran off to war instead, expecting more of the same plunder they got at Tivoli. With summer starting, your enterprise is currently nothing more than a few dozen old peasants in shacks east of the marshes. Your agents have been dispatched. While it will take time for them to complete their work and return, I’m going to go ahead and post for you part of Senator Basile’s inquest on getting a copy of the Corpus Juris Civilis since you would have found the same information. You have paid two Wealth this season to Il Signore. You now have zero Wealth. While you have hidden the sorry state of your finances from your fellow Senators for now, your means are no longer sufficient to support yourself as a member of the Senatorial class, let alone as one of its leaders. If you remain at zero wealth for more than a season or two, you may be discovered and cast out as a pauper! There are no civic granaries in Rome. Some landowners and wealthy peasants have their own, and there are a few formerly controlled by the Church, but the city has no plan for dealing with a food crisis caused by siege. The notaries and scribes you have contracted have produced the Iter pro peregrinis ad Romanum (A guide for the Roman traveler), a small codex describing the city’s most important churches, monuments, and places of lodging. The creation of these codices was expensive and time-consuming, but you have managed to produce three copies. They are not fancy or illuminated manuscripts, but they are a useful compilation of information for the pilgrimage. Additionally, you were able to commission several hundred picture-pamphlets for pilgrims to buy. Notaries are not the best artists, but the maps at least are helpful even for those who read very little. There was an interest in these maps among those who could afford them, but it did produce a few scuffles – the Romans who hire themselves out as guides during Holy Week were less than pleased at someone selling maps to make them superfluous, and your men were occasionally assaulted by irate Romans throwing dung and rocks. Though you managed to make some profit on the venture regardless, this was only enough to recoup most of your expenditures on the bound codices. All in all, you managed to just about break even on the entire effort – perhaps not a resounding commercial success, but certainly not something to regret. You spent 1 Wealth this season, and gained 1 Wealth this season. This “flax” business is more complicated than it looks. The mature plants have to be pulled up by the roots, then dried, then “retted,” which means they must be immersed in a pond or left out in the dew to partially rot. The stalks must be then “broken” with a mallet or a specially designed flax break, “scutched” with a bat and special board to separate the woody parts of the plant from the fiber, and then “hackled” by running the fibers over and over through a metal comb. Only then do you have linen fiber, which must then be spun into thread and woven into linen cloth. Witnessing this process is all well and good, but for Rome to have its own linen industry it needs workers who are skilled at these various processes. Simply viewing each step, unfortunately, will not allow your agents to truly understand the trade or teach it to a horde of peasants. But how to acquire experienced flax-workers? Your agent in Naples has sent word that Pisan shipping has resumed after the winter storms, and that a few of their cargo ships have been observed carrying marble. He was unable to independently confirm the origins of this marble – it could be from Tuscany or pillaged from Ostia. Since 1 Wealth is defined loosely as “a ship’s cargo of trade goods,” finding a ship that can carry 2 or more Wealth in cargo is impossible unless the cargo happens to be particularly compact and valuable (like silk, gold, or spices). While the construction of galleys is controlled by the state, either Gaeta or Naples would be able to build you a roundship – the standard sail-powered cargo vessel of the time – for 1 Wealth. It would occasionally require some maintenance, of course. Unfortunately there are no good books on shipbuilding to be had, mostly because craftsmen like shipbuilders are largely illiterate and rely on the master-apprentice relationship to convey the skills and techniques of their trade from one generation to another. The vast majority of the shipbuilders in the Sicilian kingdom are Greeks, whose ancestors likely built ships for Justinian and continue to do the same for Roger. Your agent has reported his initial impressions of Pisa and its relations. It is a strongly defended city, though he hopes to give you a more detailed report next season. Their relationship with Duke Welf, as far as your agent can tell, is nonexistent; they pursue their own affairs as if they were an independent state, and the Duke lacks the power or interest to exert even nominal control over them. They have little diplomatic relations with the cities of Romagna, being far more concerned with the neighboring cities of Tuscany, who are often hostile to Pisa and resent its control over the coastline and Tuscany’s seaborne trade. Bologna has been a free commune since 1116, and governs itself without Papal interference. It was Emperor Henry V who granted them this privilege, and since then Bologna has been generally a pro-Imperial city with closer relations with the German Emperors than with the Pope. The Studio, Bologna’s famous university (the first in Christian Europe), was opened in the 11th century with Imperial funds, and it enjoys many Imperially-granted economic privileges. Whether they will be as cooperative with Frederick as they have been to previous Germanic monarchs is unclear, but your agent is monitoring the situation as best he can. Your agent has reported two Pisan ships pulling into the Tiber mouth to load marble this season. It is not an easy process because of the weight of stone and the lack of any pier or other loading structure – they do not take a great deal of marble, but only the choicest pieces they can find columns and detail work. They did hire some of the locals to help them load the ships, but the Gregoriopolitans don’t seem to have any greater role in the venture than occasionally serving as hired labor. E_E, I realized that you hadn’t actually given me an estimate on how much iron you wanted, if any. I’m going out of town and need to finish the update today, so I don’t have time to delay it and await a PM from you, but go ahead and send me a PM regarding what you want from Iberia and I will make it happen retroactively. The masons have completed work on the body of the chapel, and now your hired craftsmen and artists move on to the longer and more delicate process of smoothing, finishing, detailing, decorating, painting, sculpting, and so on. If you have any further changes to make as to the decor, now is the time to do so! Rome, being a city of a million that now holds less than thirty thousand, has plenty of empty real estate. Your influence as a senator has allowed you to procure some parcels quite reasonably, though it will take time (and Wealth) to actually build inns and taverns here. You have constructed the wooden cross for Senator DeVinti. Your expedition to Tre Fontane and Gregoriopolis occurred without incident. The monks of Tre Fontane, though still suspicious of armed Romans, allowed you inside once you had disarmed and courteously showed you the chapels and relics of their abbey. You proceeded to Gregoriopolis, where the locals were happy to purchase what wine they could. You were forced to mark down your markup somewhat – the Gregoriopolitans simply don’t have a lot of money – but in the end your losses were minor. The residents informed you that their chief other need was cloth, for the marshes were a poor place for sheep and their clothes were quickly ruined by the salt and muck of their environment. Even the priests, who were the least receptive to the Roman “takeover” of the region, admitted they needed new vestments and altar cloths. “Investing” in the salt fields would, apparently, require manpower – the Gregoriopolitans informed you that Senator diFontane had set up a small settlement elsewhere in the marshes to exploit the salt fields, but that the war in Sabina had pulled away many of the local peasants who might otherwise have made up his workforce. To make more salt, what is needed first and foremost is more laborers, but few wish to work in this unhealthy region. Your evaluation of the markets of Latium will take time, and your agents have not yet returned. You may expect a fuller report later in Summer. As for Rome, the greatest demand is more work – the Pope and the church hierarchy employed many craftsmen in building and decorating new churches and palaces, and the loss of these church magnates has hurt lower-class tradesmen like carpenters and stonecutters. While the popolo grasso may be delighted that they are “free” of the Pope, there are growing rumblings among the people of the popolo minuto that things are worse off now without him. In material terms, Rome has few desperately needed imports; only the wealthy and a few niche industries require foreign-produced items like iron, sugar, alum, and linen. You have spent 2 Wealth this season. So far, Consul, your campaign has been successful, if slow. Your forces have secured the “friendship” of the Lord of Monte Ritondo and occupied Castrum Nerulae, though Castrum Capofarfa seems it might prove to be a trickier one to tackle. As you are not in the city this turn, you are somewhat limited in your actions. You may send letters as normal, but may not deliver or hear speeches in Rome. Some other activities may be made impossible by your absence, depending on what your orders are. Note that there will be an election at the beginning of Autumn – while you can still stand for elective office if you are absent from the city, your effective Influence will be reduced because you are not physically present to corral senators and votes. Unfortunately, the lands you raided had few cattle to speak of; at most, you have acquired a few dozen. You spent 1 Wealth this season. Still need to do letters, front page, maps, etc. Here is the deal: I am going on vacation. I am leaving tomorrow and will be gone until Thursday. If I have omitted something or made a mistake, go ahead and tell me as usual, but don't expect a correction until I get back. On the assumption that I haven't screwed up too badly and y'all are going to get along fine without me, I will announce the due date for next season as Sunday, March 11th. Hopefully we can sort anything out between when I get back and the due date. I have been induced by the CBG chat crew to give you a "campaign map," so here it is. Front page updated, letters still coming. The Abbot of Farfa, alarmed by the unprovoked Roman attack on his demesne, has sought our arbitration as a neutral party, and we have agreed to his request. He asks that you remove your forces from the territory of Farfa and return the castle of Nerola to its rightful owner. The Romans will agree to a general truce, and the Abbot will pay an indemnity of [3 Wealth] and guarantee Roman merchants and travelers free and unhindered passage on the Via Salaria. The Faliscan League believes your acceptance of this very fair offer would go a long way towards preventing hostilities from spreading. I would ask the pleasure of your company for dinner at my residence. Patrician Pierleone will be in attendance. You may bring your own guests as you like. I hope to have an excellent repast and perhaps a fruitful discussion about certain affairs concerning our dear city. 1. Still reading and thanks for the update- but shouldn't senate wealth be 2 wealth due to Da Vinti's contribution last turn? 2. Since there are 100 senators, I'm a bit surprised that none have contributed to the city wealth/defense fund, following Basile, da Vinti, and ?? 's lead in the contributions. What may be the reason for "all" of them to hold back? a. how much Siclians pay for salt currently? b. how much it will cost to get enough gregoriopolitan salt ready for them and shipped? Oh and elemental elf- just so that we're on the same page: were we ordering iron this turn? I think my opinion was that I'd be for it if we can make the whole procedure work... but currently we can't make the procedure work unless we get the blacksmiths. That being said, I think we would have needed to send the ships this turn for everything to work out in the end? OOC thoughts- how can we make it work? You mentioned to attract blacksmiths to the area. It seems they would only come if there was work pre-existing in the demense. The only way for profit would be to sell to others, like the Sicilians. If we wanted to build the chainmail ourselves, then we would need to wait 1-2 years so it would be ready maybe around the time that Frederick arrives. OOC: I think my contributions have been eaten whole by Basile. Once for the Justice system and another for the walls... or the Aqua Virgo? I'm reading Magnus' orders for last turn and I don't see any contribution... if I'm missing something, give me a page link and I'll correct it when I get back. Last turn there was 1 Wealth in the Defense Fund and nothing in the treasury; the 1 Wealth in the defense fund was spent by Basile this turn, and 1 Wealth was added to the treasury by Patrician Pierleone paying his annual duty. Since there are 100 senators, I'm a bit surprised that none have contributed to the city wealth/defense fund, following Basile, da Vinti, and ?? 's lead in the contributions. What may be the reason for "all" of them to hold back? The senatores consiliarii are among the richest Senators. The average senator probably has 2 Wealth. As for those who have more - well, clearly they're just not sufficiently motivated. Also, keep in mind that many of the equites, the upper class of Rome, are not Senators. I'm just about to step out the door here, so I'll tackle the other questions when I get back. Hey guys, where was that resource map Polycarp once released? I've searched, apparently I'm blind. Can't find it.